maple syrup, sliced almonds, sour cherries. sunlight. Where do you get GF dried fruit? I buy my dried fruit at Trader Joe’s. On the West Coast, all TJ’s dried fruit is gluten-free. how do you make teff porridge? Your site is awesome–I have become obsessed with baking after following your blog the past 18 months. You’ve helped me make some fantastic treats 🙂 Thanks so much!!! Yum – my favorite breakfast! That looks just like the chocolate Malt-O-Meal I saw in the store the other day. I’m sure Malt-O-Meal has gluten in it though. How does dried fruit come in contact with gluten. Do they dust the raisins and such with flour to keep moisture away? I like teff served that way too. My older sister and mother turned me on to eating the cooked teff grain for breakfast. Prior to that, I really only thought of teff as a flour to use in some of our breads and other recipes. Nice picture Shauna! It’s amazing how much sunlight adds to the dish. Truly. When you live in the Pac NW, it adds to everything when you can get it. Hm. Is teff nutty like quinoa? I too have only seen teff flour, and not whole teff grains like this. I’ll have to look into it, thanks! I’m so happy I could help! Teff porridge is so easy. Whole grain teff (1/2 cup) meets boiling water. Fifteen minutes later, you have porrdige. I know! You started me on it. Malt-o-Meal definitely has gluten. That’s okay. I prefer teff. Some dried fruits are dusted with flour. Some are processed in a facility that processes gluten. In fact, I went to Trader Joe’s today, and some of their fruit says on the package, “Made in a facility that also uses wheat.” Gah! I won’t be eating those anymore. I know. Isn’t it amazing what we are discovering? 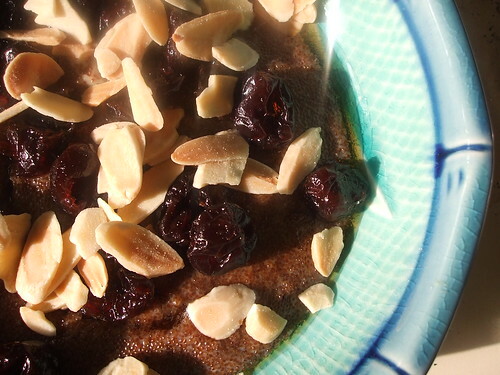 Teff porridge has this beautiful, chocolately-maple-syrup taste to it. Just gorgeous. Even the Chef loves it. I have a link to whole grain teff on the right-side of the screen of my website. I want everyone to be able to buy it! Terrific! one more addition to the morning repertoire! I love TJ’s and just can’t wait till the Bellingham one opens in the summer. I think the new labeling requirements are going to have a big influence on that “manufactured in factories containing wheat” notation. I was hoping you had found a magical place where the dried fruit wasn’t contaminated. Oh well. Back to drying my own. Which brand of teff do you use? What about teff flour? Thanks! hi! 🙂 first time writing– just wanted to ask if anyone heard about TEFF grains being contaminated (not by gluten)something about that is why the iron level are so high.. it's surely a false statement– but wanted to ask if anyone heard anything on that- i love Teff– especially being anemiccc!